When spending time with my sister at Mayo Clinic following her Stem Cell Replacement surgery, I had lots of time to myself when she was resting. I was glad that I planned ahead and brought some crafts to work on. 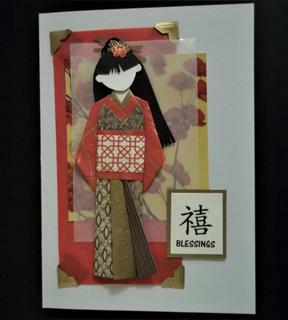 I spent hours happily making Asian paper dolls embellishments so am using one on my card. 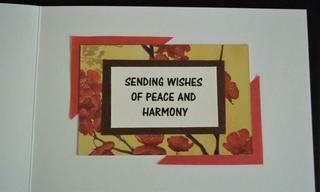 My challenge for you is to use an embellishment as the focal point of your card. And... if you use an embellishment that you created [flowers, card candy, etc.] you'll get your name put into the drawing twice. You have Monday, Sept 10 at 7 AM to enter your card. I'll then draw a winner via Mr Random.org. Hope you can join in on the fun. Last edited by MrsAsperin-Kathy on Mon Sep 10, 2018 7:28 pm, edited 4 times in total. I am in our car on the way home. Larry has just driven through Denver and we have about 8 hours more on the road. Kathy, your card is very nice! I like the doll a lot. Thank you so much for hosting this week. I hope everyone has a nice Labor Day. Kathy - what a great doll! My niece asked me if I would make her some Thank You cards for her Baby Shower in a SUPER HERO theme... Of course I said yes but I was stumped for awhile as I didn't have Super Hero stamps or paper. Katrina asked if she could use the Cricut to make paperdolls for another project and she found the Superboy costume on the cartridge. DUH! It's not as fancy as I wanted to do, but she helped me make 25 Superboy dolls and I began to experiment! Kathy,very cute Your niece will love it. Trudi, I LOVE those! They are so fun and your niece is going to adore them. Made a couple cards using the card candy I made for the swap. I had made some extras of each in case someone joined last minute so these were easy peasy. Trudi, those are adorable! Love your super boys and those city silhouettes are pretty impressive, too. Okay, I made my alligator out of some thin metal. In fact the "water" strips behind are alcohol ink on some thermal tape (house repair stuff) I had.